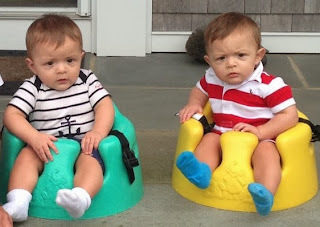 Even before I was expecting, I had heard moms talking about how great Bumbo Floor Seats are, so once I knew I was having twins, I picked up two seats with the new three-point harness included. 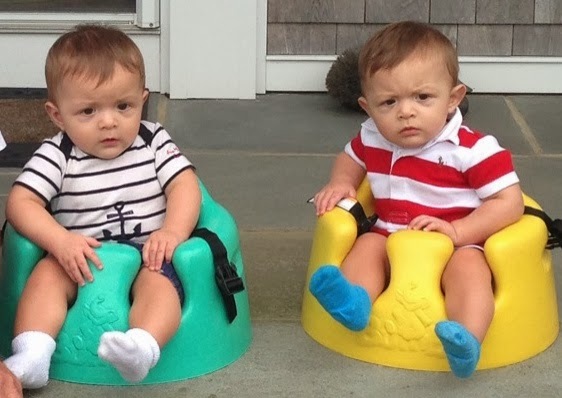 My boys especially liked being able to sit-up in them instead of being on a floor mat or stroller all the time. I would give them toys to play with or a book while they were in their seats too. Above they are people watching outside of Grandma's house a few months ago. At first, they would only last 5 minutes or so when they were still new to having their head unsupported, but eventually they were quite happy being in them like big boys. The Bumbo Floor Seat's contoured design supports posture and helps babies maintain a sitting position before they can sit upright on their own. With the Bumbo Floor Seat, parents can engage with their child during key developmental milestones from playtime to feeding time and give baby a chance to see his or her surroundings from a new perspective. And like with most baby products, The Bumbo Floor Seat is designed to be used with adult supervision and should never be used on raised surfaces, only placed on the floor, even with a belt. Ages: 3-8 months and only once baby can support his or her head. I also like that the seat is made from comfortable low-density foam that is soft (not a hard plastic like other seats) and easy to wipe clean. It's also lightweight and portable, so we would take it with us when visiting relatives' houses. A new add-on is the Bumbo Play Tray ($11.99), which is sold separately and attaches to your Bumbo Floor Seat ($39.99) to create a fun play surface that keeps toys and snacks within baby’s reach. The Play Tray is great for feeding time and playtime. Now I just learned that every Bumbo purchase helps children in need via their Bumbo Cares program, which donates products to daycares, feeds and shelters orphans, provides daycare for children with special needs and more. Just last month the company announced that they reached a $10 million milestone in charitable contributions to Bumbo Cares. Awesome! 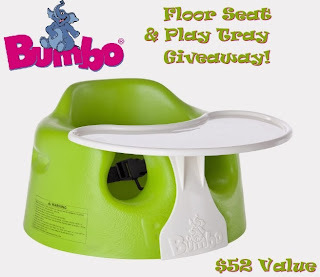 Giveaway: Bumbo is letting me giveaway a Bumbo Floor Seat with Play Tray a $52 value! Enter the form below for your chance to win a Bumbo Seat for your baby or to use as a great shower gift.